Are you looking for a sales career with Derby motorhomes? We are looking for self-motivated, well presented sales people who can hit set sales targets to join us here in our central location in Derby. Derby Motorhomes are Auto-Sleepers motorhome specialists and the first motorhome dealer to exclusively sell and service Auto-Sleepers. A sales career with Derby motorhomes will require you to maximise every opportunity to sell new and used motorhomes to our customers and will demand an understanding of our sales process as well as the ability to adapt to the individual needs of our customers. 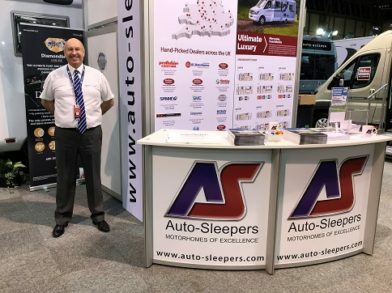 We have been a leading Auto-Sleepers motorhome sales and service business for some time and will provide a full training and support programme to help you learn about the Auto-Sleepers product. If you are enthusiastic, self-motivated, customer oriented, well presented, professional and have a good sense of humour, you are just the person to fill the position of Sales Executive.The successful applicant, ideally, will have experience in a motorhome, caravan, car or a similar sales environment. A basic knowledge of computers would be an advantage, however not essential, as full training will be given. This is a retail sales position and requires you to sell new and used motorhomes from our dealership in Derby and from time to time, while working at events away from the dealership.You will be expected to process your orders via our dealer management computer system, advise our customers old and new and interact via social media with potential customers.You are likely to be the first contact many of our customers will have with us, so you must be smart and presentable with excellent social skills, telephone manner and perfect grasp of English, both spoken and written. Daily duties will include selling motorhomes, updating the customer database, customer follow-up and general showroom duties. Our industry relies on external events to promote sales and Derby Motorhomes attends a limited number of these various events throughout the year; you will be expected to attend these events representing the company and selling motorhomes. Overnight hotel accommodation is sometimes required which is paid for by the company. Hours of work are full time and requires weekend and bank holiday working. Some Flexibility will be required around busier times of the year.A rota is operated allowing some weekends off as well as week days off.As part of the Derby motorhomes team, if you excel in your role, you will be given the opportunity to further your career with additional training opportunities and future progression. So, if you can create an opportunity rather than wait for one to happen apply now.